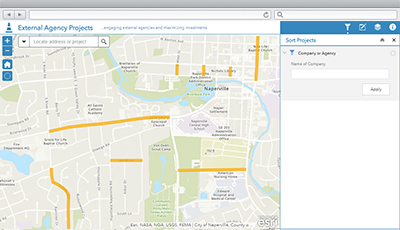 External Agency Projects is a configuration of Web AppBuilder for ArcGIS that can be used by private utilities and other external agencies to share capital projects planned for their respective infrastructure. This information helps identify potential project conflicts and becomes the foundation for public-private partnership opportunities. To deploy External Agency Projects with the ArcGIS Solutions Deployment Tool requires specific software. To manually deploy External Agency Projects in your organization requires specific software. Application External Agency Projects An application used by private utilities and external agencies to share capital projects planned for their respective infrastructure. Map External Agency Projects A map used in the External Agency Projects application to share capital projects planned for their respective infrastructure. Feature layers ExternalAgencyProjects A feature layer used to store capital projects planned by external agencies or private utilities. Below are the release dates and notes for External Agency Projects.